Analysis: Kelce had surgery to address a lingering ankle injury after the Chiefs were eliminated from the playoffs. While the procedure reportedly wasn't too serious, the rehab process may keep him off the field through OTAs and June minicamp. There hasn't been any suggestion that the 29-year-old tight end is in danger of missing the start of training camp in late July. Analysis: It's worth noting that Kelce is expected to be back in time for training camp after undergoing surgery to "clean up" a preexisting injury. While the procedure doesn't sound serious, it's something worth monitoring throughout the course of the offseason given Kelce's sheer dominance the past three seasons, as he's recorded 3,499 receiving yards and 22 touchdowns over that stretch. Analysis: Kelce tied for the team lead with nine targets, though that didn't translate to a strong performance as he recorded his lowest yardage total since Week 10 against the Cardinals. He was largely bottled up by the Seahawks' secondary, and while his longest reception went for 23 yards, he averaged under eight yards on his other four receptions. On a positive note, he'll have an advantageous matchup against the Raiders in the regular-season finale and should command plenty of targets once again. Kelce brought in seven of nine targets for 61 yards in the Chiefs' 29-28 loss to the Chargers on Thursday. Analysis: Kelce's reception total was tops on the Chiefs, while his receiving yardage checked in behind only that of Damien Williams'. The seven-year pro now has consecutive seven-catch efforts, and he's tallied no less than six grabs and as many as 12 in seven straight games. Kelce will look to continue filling his expansive role in Kansas City's high-octane attack against the Seahawks in a Week 16 Sunday night interconference battle. Kelce corralled seven of nine targets, compiling 77 receiving yards and one touchdown during Sunday's 27-24 win against the Ravens. Kelce caught 12 of 13 targets for 168 yards and two touchdowns but lost one fumble during the opening drive of Sunday's 40-33 win against Oakland. Kelce caught 10 of 15 targets for 127 yards and a touchdown in Monday night's 54-51 loss to the Rams. Analysis: Kelce was a consistent presence in Monday's scoring explosion, leading the Chiefs in targets and tying Tyreek Hill for the lead in receptions. Although Hill went off for a career-high 215 yards, Kelce's 127 still marked a season best. Furthermore, his four-yard touchdown during the third quarter gave him seven on the season and four over his last four games. That sends the All-Pro tight end into Kansas City's bye week on a strong recent run. Kelce brought in six of seven targets for 46 yards in the Chiefs' 26-14 win over the Cardinals on Sunday. He also fumbled once. Kelce caught seven of nine targets for 99 yards and two touchdowns during Sunday's 37-21 win over Cleveland. Analysis: The Browns played Kansas City close for much of Sunday, but Kelce helped the Chiefs pull away midway through the third quarter by skying between defenders for a 13-yard score, his second of the game. Kelce is finding a groove with three touchdowns in his last two contests, after just three during the season's first seven games. Next Sunday brings an Arizona pass defense ranked in the top 10 in the league in surrendering just 225 passing yards per game. Kelce caught six of 10 targets for 79 yards and a touchdown during Sunday's 30-23 win over Denver. Kelce brought in all five of his targets for 95 yards in Sunday's 45-10 win over Cincinnati. Analysis: Backup tight end Demetrius Harris hit paydirt instead, with Kelce doing all of his damage between the 20s. The veteran only has three touchdowns so far this year, but his 563 receiving yards rank him second among all NFL tight ends. Kelce will look to continue his steady production against the Broncos in Week 8. Kelce hauled in five of nine targets for 61 yards in Sunday's 43-40 loss to the Patriots. Analysis: Kelce had a solid day at the office, but his stat line paled in comparison to the receiving numbers Tyreek Hill and Kareem Hunt put up. The All-Pro tight end may no longer be the top receiving target in Kansas City for the first time in a while, but he has still posted usable fantasy numbers with 462 yards and three touchdowns over the last five weeks. Kelce will look to continue his consistent production against the Bengals on Sunday. Kelce caught five of eight targets for 100 yards during Sunday's 30-14 win over the Jaguars. Analysis: Kelce continues to be arguably the most consistently dangerous tight end in the game. Since a Week 1 hiccup, Kelce has caught at least five passes in every game and has either totaled 100 yards or scored in each of those contests. The way this offense is able to move the ball, even when faced with some adversity in the form of a tough Jaguars defense, Kelce should be a start every week, even against a looming and crafty Patriots defense that is sure to mix things up on Sunday. Kelce caught seven of 12 targets for 78 yards and a touchdown in Monday night's 27-23 win over the Broncos. Analysis: Kelce paced Kansas City in receiving yards and scored the team's lone touchdown through the air with a two-yard plunge during the fourth quarter. The Pro Bowler has now finished with at least seven catches in three straight games, a span in which he's topped 75 yards each week while scoring three times. Clearly on a roll with quarterback Patrick Mahomes, Kelce and the Chiefs' passing attack will now look forward to testing their strength against the stingy Jaguars secondary Week 5. Kelce brought in eight of 10 targets for 114 yards in the Chiefs' 38-27 win over the 49ers on Sunday. Kelce snagged seven of 10 targets for 109 yards and two touchdowns during Sunday's 42-37 win over Pittsburgh. Analysis: Kelce fans can breathe a collective sigh of relief. Following a disappointing one-catch outing Week 1, Kelce hooked up with Patrick Mahomes for touchdowns of 19 and 25 yards, both coming up the seam. Kelce is among the best tight ends in the league in stretching the field vertically. Now equipped with a quarterback of Mahomes' arm strength, things can get ugly for opposing defenses. Expect to see more of Week 2 Kelce than Week 1 Kelce moving forward. Kelce caught just one of six targets for six yards in Sunday's 38-28 win over the Chargers. Analysis: Patrick Mahomes had a great game, throwing for 256 yards and four touchdowns, but Tyreek Hill (seven catches for 169 yards and two scores) was the one that benefited the most. It's possible that Kelce's stats take a minor hit this season with the quarterback switch from Alex Smith to Mahomes, although the presence of Hill and newcomer Sammy Watkins should open up the middle of the field for Kelce. Next week, Kelce will look to rebound at Pittsburgh. Kelce will miss Tuesday's practice for personal reasons, Brooke Pryor of The Kansas City Star reports. Analysis: Kelce wasn't going to play in Thursday's preseason finale anyway, so it won't come as any surprise if the Chiefs let him take a few days away from the team. With no injury to report, the veteran tight end should be ready for his usual hefty workload in a Week 1 road game against the Chargers. Kelce caught six of eight targets for 78 yards in three preseason games. Kelce caught both of his targets for 29 yards during Saturday's preseason game against the Bears. He likely won't play in Thursday's preseason finale against the Packers, Nate Taylor of The Athletic Kansas City reports. Analysis: Kelce has had a fine preseason and displayed that there is plenty of reason to believe he will remain one of the elite tight ends, despite the change under center from Alex Smith to Patrick Mahomes. We may have to wait until the regular season to see him again, opening the campaign Sept. 9 with a road matchup against the Chargers. Kelce caught two of three targets for 27 yards in Friday's preseason game against Atlanta. Analysis: Tyreek Hill stole the headlines with his long touchdown catch, but Kelce and Kareem Hunt also made solid contributions in the passing game. 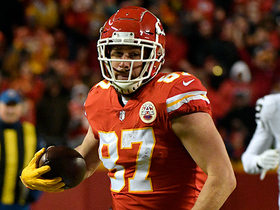 The addition of Sammy Watkins and switch from Alex Smith to Patrick Mahomes does leave Kelce with a degree of risk, but the 28-year-old still offers a rare ceiling for a tight end. Kelce is scheduled to play the entire first half of Friday's preseason contest against the Falcons. Analysis: The contest marks Kelce's first extended run working with Patrick Mahomes in a live game setting since the strong-armed QB took over the starting job this offseason, so it will be a good test of their rapport. Coming off consecutive 80-catch and 1,000-yard campaigns, Kelce is set to retain his role atop the depth chart and should be a big target for Mahomes in his first full season under center. Kelce is present for the start of the Chiefs' offseason workouts, Terez A. Paylor of The Kansas City Star reports. Head coach Andy Reid said Kelce (concussion) "probably would have been alright for the upcoming week" had the Chiefs advanced past the wild-card round of the playoffs. Analysis: Kelce was noticeably wobbly after absorbing a helmet-to-helmet hit during Saturday's loss to the Titans. Reids' comments suggest the tight end isn't experiencing any significant side effects in the aftermath of the injury. Under contract with the Chiefs through 2021, Kelce should be operating at full speed when OTAs commence in late April. 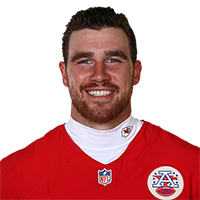 Kelce (concussion) was ruled out for the remainder of Saturday's wild-card game against the Titans, James Palmer of NFL Network reports. Analysis: Kelce was taken straight to the locker room following a helmet-to-helmet hit from Titans safety Jonathan Cyprien at the end of the first half and has now entered the concussion protocol. The star tight end didn't seem likely to return after being clearly wobbly on the field, and his status for next weekend's potential divisional-round matchup is now in question. 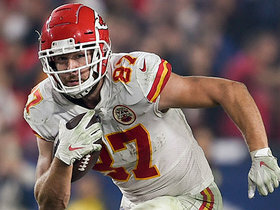 Kelce (head) left Saturday's wild-card game against the Titans, Dan Graziano of ESPN.com reports. Analysis: With less than two minutes remaining before halftime, Kelce took a helmet to the head from Titans safety Jonathan Cyprien at the end of his fourth catch of the afternoon. As Kelce got to his feet, he was clearly wobbly but was able to run the last 15-20 yards to the sideline before going to the locker room. It'd be a surprise if he doesn't land in the concussion protocol, but upcoming examinations will determine whether a return is possible. Kelce (coach's decision) is inactive for Sunday's Week 17 tilt against the Broncos. Analysis: As expected, Kelce will join Tyreek Hill as a healthy scratch for Sunday's finale, with Kansas City set to enter the postseason as the AFC's No. 4 seed. The star tight end's absence will afford Demetrius Harris the start against Denver. Kelce is expected to take a seat Sunday at Denver, Adam Teicher of ESPN.com reports. Kelce caught four passes on eight targets for 47 yards and a touchdown Sunday against the Dolphins. Analysis: Kelce hasn't gone over 50 receiving yards in either of the last two weeks, but he did reach the end zone for the first time since Week 13 with a nice snag on a high pass from quarterback Alex Smith. The 28-year-old tight end leads his position group with 83 receptions and sits only behind Rob Gronkowski (1,084) with 1,038 receiving yards entering a Week 17 matchup with the Broncos. Kelce (illness) does not carry an injury designation for Sunday's game against the Dolphins after returning to a limited practice Friday. Analysis: Kelce missed practice both Wednesday and Thursday, but he was well enough Friday to practice and is thus in line to play this weekend. Through 14 games to date, Kelce has logged a fantasy-friendly 79 catches (on 114 targets) for 991 yards and a career-high seven TDs. His consistent involvement in the Chiefs' passing attack makes the 28-year-old one of the league's most reliable fantasy options at the tight end position. Kelce (illness) is slated to miss practice again Thursday, BJ Kissel of the Chiefs' official site reports. 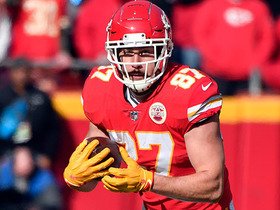 Analysis: While back-to-back missed practices aren't optimal for the tight end's Week 16 preparations, it's expected Kelce will rally in time to play Sunday against the Dolphins. 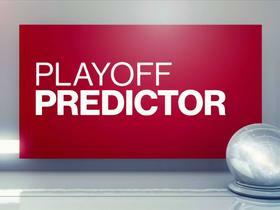 The Chiefs can clinch the AFC West with a win this weekend. Kelce (illness) won't practice Wednesday, BJ Kissel of the Chiefs' official site reports. Analysis: More on Kelce's status as the week rolls along, but at this stage we'd expect the tight end to recover from his illness in time to suit up Sunday against the Dolphins. Kelce caught six of seven targets for 46 yards in Saturday's 30-13 win over the Chargers. Analysis: Kelce finished second on the team in targets and catches, but he was unable to get loose outside of a 21-yard gain in the first quarter. This performance came on the heels of a consistent run of form for Kelce, who had at least 73 receiving yards in five of his previous six contests. He'll look to get back on track next week against a Dolphins defense that's struggled to contain opposing tight ends for much of the season. Kelce caught seven of 13 targets for 74 yards in Sunday's 26-15 win over the Raiders. Analysis: Kelce appeared to have a 17-yard catch-and-run touchdown on the final play of the first quarter, but he was ruled down inside the 1-yard line upon further review. The impactful tight end's 13 targets were six more than any of his teammates saw, as Kelce continues to serve as quarterback Alex Smith's go-to guy in most situations. He's rewarded that trust with over 70 yards in five of the past six games. Kelce caught four of eight targets for 94 yards and two touchdowns in Sunday's 38-31 loss to the Jets. Analysis: Kelce established dominance early in this one, registering a 32-yard catch and a 22-yard touchdown on his team's five-play, 75-yard scoring drive to open the contest. He burned rookie safety Marcus Maye for a 36-yard score on the next possession, but went silent after that as wide receiver Tyreek Hill did the heavy lifting the rest of the way in this high-scoring loss. Despite his team's recent slide, Kelce remains one of the league's most dangerous weapons at the tight end position. Kelce caught three of four targets for 39 yards in Sunday's 16-10 loss to the Bills. Analysis: Kelce failed to catch his lone target in a first half during which quarterback Alex Smith threw for just 41 yards. The veteran tight end ignited the offense with a 25-yard catch on 3rd-and-11 during Kansas City's lone touchdown drive to open the third quarter, but he proceeded to fade back into obscurity as his team suffered a third consecutive defeat. Kelce's still an elite talent at his position, but his struggling quarterback isn't making life easy right now. Kelce turned a season-high 14 targets into eight catches for 109 yards while throwing an interception on his lone passing attempt in Sunday's 12-9 overtime loss to the Giants. Kelce caught seven of nine targets for 73 yards and a touchdown during Sunday's 28-17 loss to the Cowboys. Analysis: Kelce led the team in targets, catches and receiving yardage in this one, finding the corner of the end zone to briefly take the lead in the third quarter. He's been extremely consistent this season, recording at least 98 yards and/or a touchdown in six of nine games. Kelce will enjoy a break during the upcoming bye before returning to action in Week 11 against the Giants. 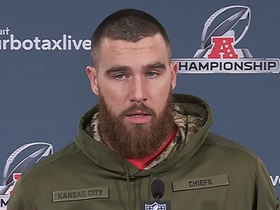 Kansas City Chiefs tight end Travis Kelce joins 'Super Bowl LIVE' to talk QB Patrick Mahomes MVP odds. 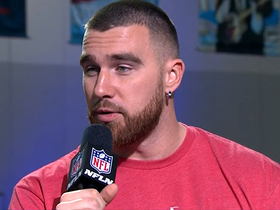 NFL Network's Cynthia Frelund reveals her game projections for Kansas City Chiefs tight end Travis Kelce. Kansas City Chiefs tight end Travis Kelce discusses what it means to face off against New England Patriots tight end Rob Gronkowski. 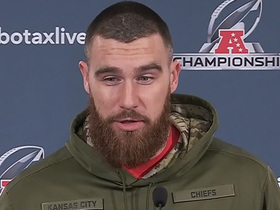 Kansas City Chiefs tight end Travis Kelce addresses the media leading up to the AFC Championship Game against the New England Patriots. 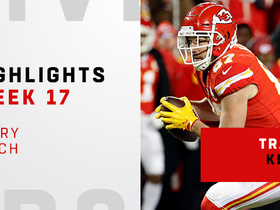 Watch every catch from Kansas City Chiefs tight end Travis Kelce Week 17 of the 2018 season when he broke the record for most receiving yards by a tight end in a single season. Kansas City Chiefs tight end Travis Kelce rips off a 25-yard catch and run against the Oakland Raiders. 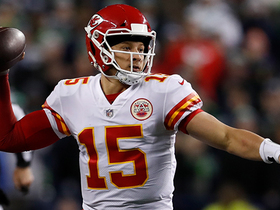 Kansas City Chiefs quarterback Patrick Mahomes splits Seattle Seahawks defenders on 23-yard strike to tight end Travis Kelce. NFL Network's Adam Rank ranks his top five fantasy tight ends for the 2019 season. Los Angeles Chargers safety Derwin James' strong tackle of Kansas City Chiefs tight end Travis Kelce prevents a big first down pickup.